The past few weeks of February and first two days of March brought us wonderful weather. We are in for couple of rough days but warming towards week end. The current lake level is at 614.25 with a water temperature of 48 degrees. The striper fishing has been very good for me when using live bait. 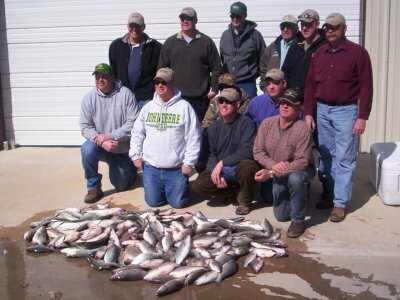 I've been fishing mainly west of Highport Marina and sometimes west past the HWY 377 Bridge. 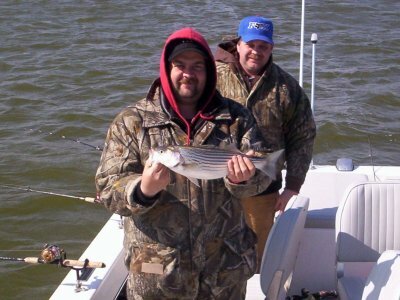 I have had very good results catching good numbers of Lake Texoma stripers in 30-40 feet water, sometimes to anchor and other days having to drift fish. If you like sandbass, now is a good time to go fishing for them. have caught just as good numbers of good sized healthy looking sand bass also fishing off the creek banks and ledges. Some days I have put down 8 to I0 anchors to get to the fish that wil eat, am having no problem finding fish, just have to be patient to keep at it and find the hungry ones. Spring break is right around the corner and we expect to see alot more boaters out on the lake. If you haven't done so already it's time to check your boat out, batteries, fire extinguishers, bilge pump , floatation devices, etc.., so that your day on Lake Texoma is a safe and enjoyable one.